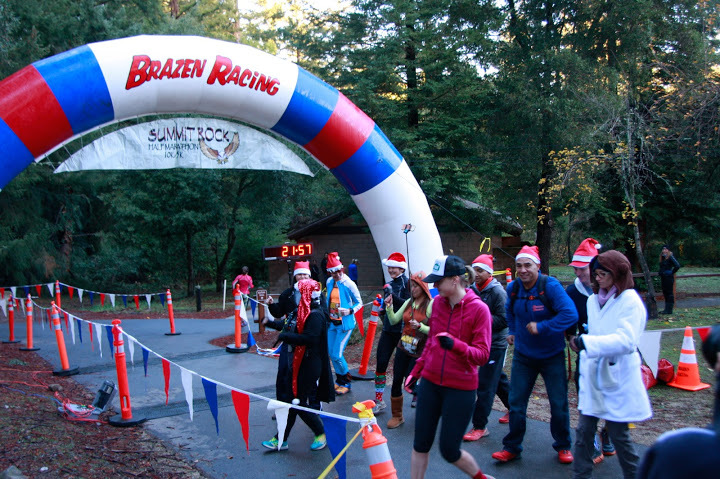 Last weekend, I ran the Brazen Summit Rock half marathon trail race. 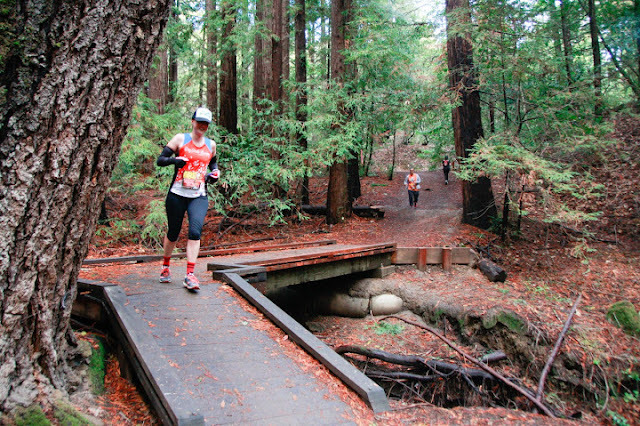 The race is held at Sanborn County Park and is one of the harder half marathon courses in the area - I love a good challenge! Brazen runs a similar event in June called Trailquake, which has a slightly different course and I'd say steeper climbs on the front end. I really love both events. Race morning was really cold for the Bay Area, around the high 30s or low 40s. I still say that 40 degrees here feels way colder than 40 degrees did in the Midwest; it doesn't make sense, but it's real. There was a serious chill in the air. Kevin and I parked, kept on all of layers, and wandered down to the start area to get our bibs and shirts. Standing outside was cold, so we then went back up to the car and sat inside it for about 25 minutes to stay warm. I made a last minute decision to race in my singlet, arm warmers, and gloves instead of a long sleeve shirt and hoped I wouldn't be too cold. Many friends were running or volunteering at this event, so it was fun to chat with everyone before the start. Go Far was there to do shoe and gear donation collection for Mission Atletica, plus many more Go Farians would be volunteering at the turnaround aid station for the half. 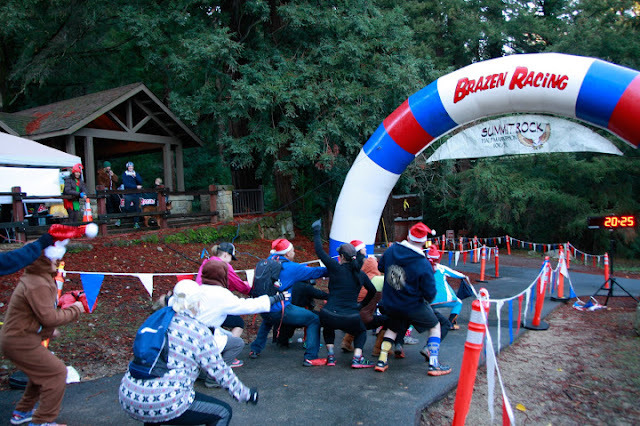 Before the race, Brazen started playing the Cha Cha Slide and I happily joined in as a warm up! 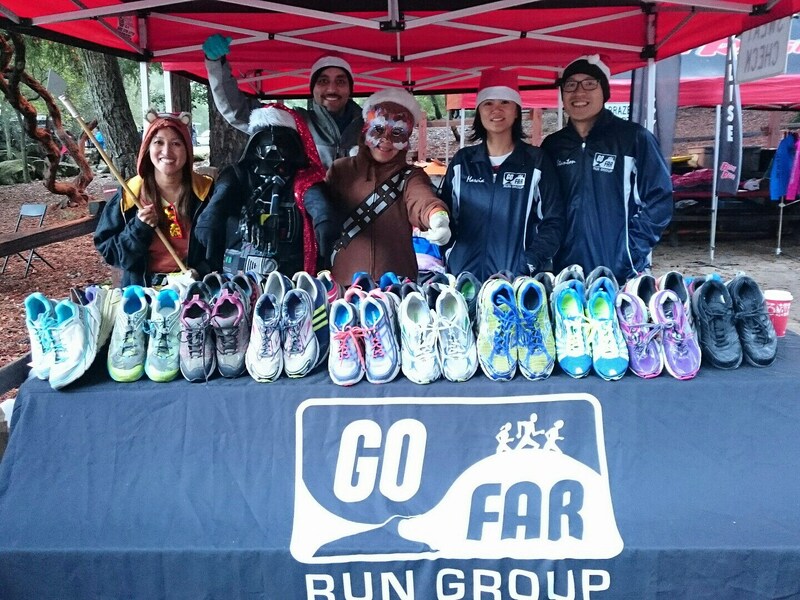 To make this race even more exciting, Brazen had Star Wars themed swag and music for the start and finish. It was so fun to run into the woods with the Star Wars opening theme playing! We headed through the trees on a gentle upward slope for about three quarters of a mile, then we got into the big climb. The December course climbs the switchbacks instead of the steep side, which felt harder to me because it seemed to go on for much longer. Don't let the above photo fool you, there was definitely a lot of power hiking going on during that climb. I felt strong and pushed the climb harder than I have in the past though, which was a good decision. The other good decision was to leave the long sleeve in the car! I was more than warm enough once we started climbing. There were a couple of times along the ridge that I felt chilly, but then I made myself run harder and that quickly took care of it. Go Far was manning the aid station at the half marathon turnaround, and I'd very much been looking forward to their friendly faces while I was climbing. 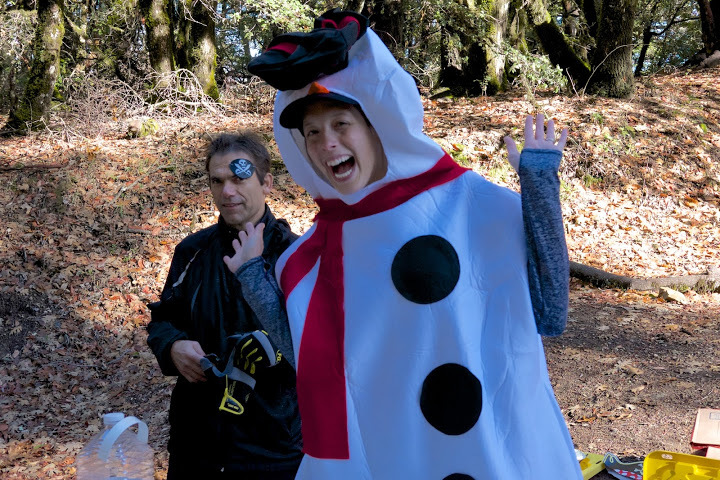 They set up the aid station with a pirate theme and even had a pirate banner in the woods before the aid station. Everyone was enthusiastic and having a good time cheering us on; thanks so much to them (and all volunteers of course) for being out there! After the aid station we had to climb some more. The biggest difference between this course and the June course was the downhill segment in the middle. You know what that means...what goes down must come back up. 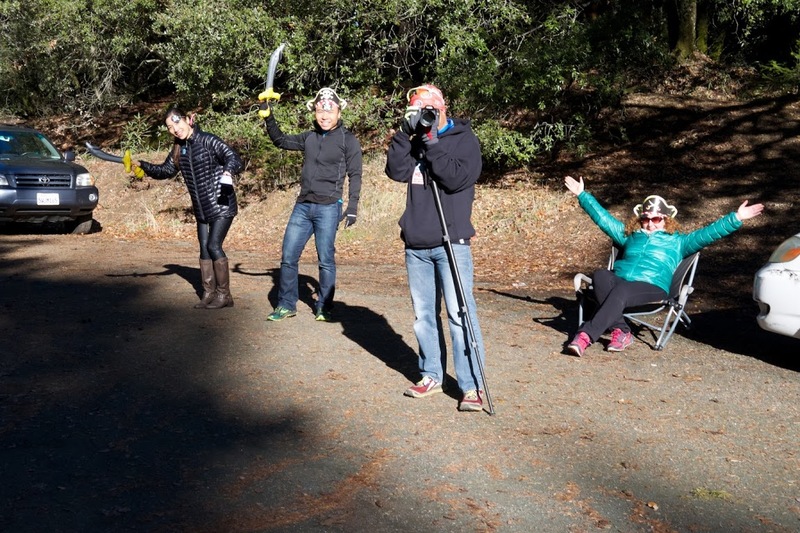 At Trailquake, once we topped out the big climb it was a pretty gentle roll. Summit Rock had noticeable extra climbing miles in the middle. Overall I still felt good and kept pushing myself to run when it felt hard. Once we hit the downhill switchback portion, I took it slower than in the past because I've fallen recently and wasn't feeling super confident on the wet trail. Even with that, I was able to run strong and finish the race in 2:51:16 - that's 5 minutes faster than my previous Sanborn half marathon. Even though the courses aren't identical, the climbing difficulty is similar. I consider that a personal victory! Finishing was especially fun because all of my friends were at the finish line cheering; Eddie, Kevin, and Derek had run the race plus the Go Far volunteers were back from the aid station. Keeping with the theme, the bibs, medals, and shirts were Star Wars centric. The usual mascot for Summit Rock is an owl, and this case the owl was a Jedi. Jedi Owl medals, complete with glow-in-the-dark lightsaber and eyes. Swag, front of shirt. Note that on the bibs he's a Sith Owl. This race was my first in the Brazen Ultra Half series, one of my race goals for 2016. 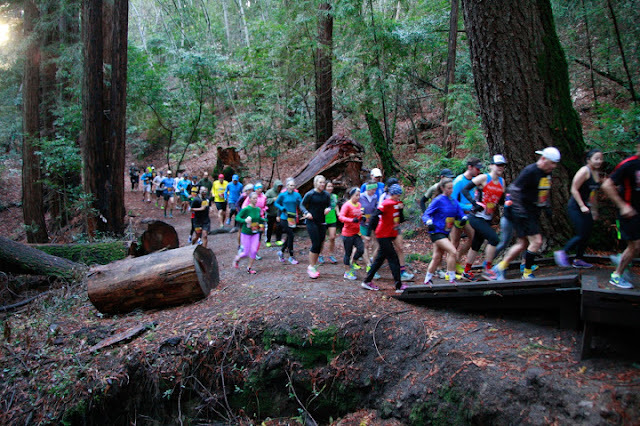 I love and highly recommend Brazen events, whether trail or pavement, although (shocker) I prefer the trail ones. I'd also like to give a shout out to Brazen for providing all of the awesome free photos! Volunteers take tons of photos at the event and provide them to runners to commemorate the race. Next up: Brazen Almost New Year's Eve on December 27 and Brazen New Year's Day. A little late here, but congrats on a strong race! I ran this one last year and it was a tough one. I love the Jedi Owl - so cute!